I absolutely LOVE raw, vegan desserts and I’m a true advocate for eating clean. I believe that the body thrives best off of whole, natural, and unprocessed foods. 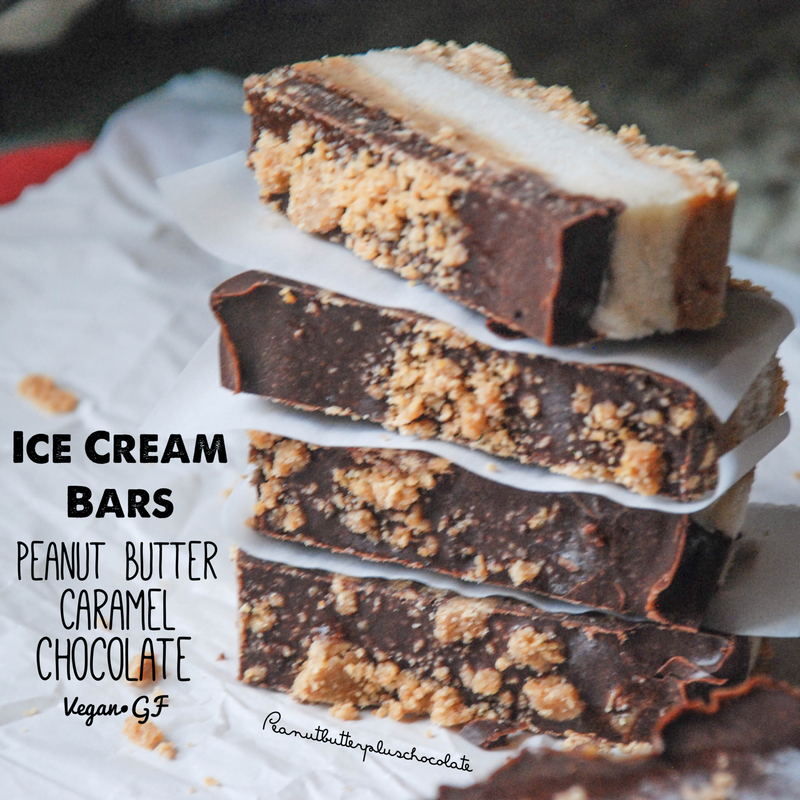 This four layer ice cream bar will knock your socks off and make you feel good about eating dessert! Some people have asked me about the macros for these bars and to be honest, when I make a vegan dessert, I never calculate the macros. The fat and calorie content will be very high. But don’t forget these are all good fats from coconut and peanuts. Coconut oil actually helps promote weight loss, so don’t be afraid of the good fats! I wouldn’t recommend eating an entire tray of these, but one or two pieces will only do the body good! DO YOU LOVE THIS RECIPE? IF SO, PLEASE PIN IT USING THE PINTEREST BUTTON ON THE BUTTOM! DON’T FORGET TO SHARE IT WITH YOUR FRIENDS! ***If you have a nut allergy, try replacing the peanut butter with Tahini. 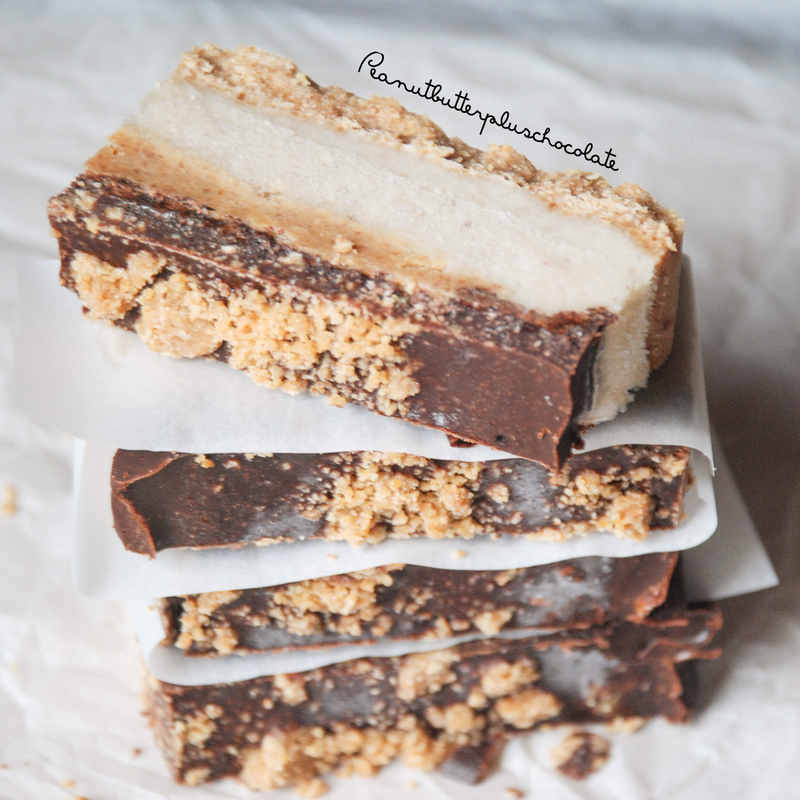 For the peanut butter layer, mix all dry ingredients together and then add wet ingredients. Mix until dough forms (should be a bit crumbly but not too dry). Press all but 1/4 c dough into the bottom of an 8×8 inch pan lined with parchment paper. Save the 1/4 c for topping. Place the pan in the freezer while you prepare the ice cream layer. Pour ice cream layer over the peanut butter cookie layer and spread evenly. Place in the freezer for 30 minutes to an hour or until firm. Blend caramel layer in a food processor or blender. Again, be patient, keep scraping the sides, it will become a puree. Spread caramel over ice cream layer and return to the freezer while you prepare your chocolate layer. In a microwave safe bowl or in a double boiler, melt coconut butter, oil, and maple syrup together. Whisk in cocoa powder. Pour chocolate over the caramel layer, sprinkle with remaining dough and return the freezer for 2 hours before slicing into 12 bars. Enjoy!